A versatile, tasty way to get a warm meal quickly. Have 1/2 cup cooked rice ready before starting to cook the rest of the ingredients, use a rice cooker or instant brown rice. Take 1/2 boneless skinless chicken breast and cut into bite size pieces. Heat non-stick skillet 8" or larger on slightly higher than medium for at least 1 minute, then add a small amount of the liquid amino (like Bragg's) and the cut chicken. Cook until just cooked through (about 4-5 minutes) turning over at least once. Set aside. Beat egg in bowl. Using the same pan; if there seems to be about 1 tbsp of fluid left over from cooking the chicken add egg, if not add a little more liquid amino. Cook egg flat until top is firm enough to flip over. Use spatula to chop up the egg in the pan into small bite size strips and immediately add cooked rice and the chicken. Add liquid amino, garlic, ginger and pepper. If the dish seems dry you can add small amounts of warm water. Once everything is tossed reasonably together, place in your favorite bowl and enjoy! It can always be placed in a storage container for a quick delicious meal later (make sure to let it cool before placing the lid on and storing in the fridge). Variations: the powdered spices in this recipe are for time saving purposes, so play with them. Use fresh spices or even add some of your own. For a meat free version use a larger skillet to cook 2-3 eggs and add any vegetables you like in place of the meat. This dish is also nice with broccoli and a firm tofu. Also, alternative grains can be used such as a mix of brown, basmati, jasmine, and wild rice; or quinoa or millet instead. Note: you can also make this in even larger batch to portion and freeze for later use. 370 members have added this recipe to their cookbook. I love the idea of this recipe. When I made it I left out the ginger, and added a cup of frozen stir-fry veggies. I sauteed the veggies in a 0 calorie Pam spray and added them in at the end. I also used more soy sauce. It ended up being more calories, but worth it b/c it was YUM-O! Also, I used the success boil in a bag rice, which took less time, and made it easier. Well of course I'M foing to give it a five but I'd like to add a suggestion to this recipe with new found information. As of today I am starting proper food combining, which I have inadvertently done in the past and had success with but didn't realize what I was doing to make it happen. My suggestion is for proper food combining, replace the brown rice with any non starch vegitable/s that you like and leave out the egg. If you substitute the brown rice you could get away with keeping the egg and it would be ok but if you want to adhear strickly to the proper food combining leave it out. I do really love it with the brown rice and eating it that way a couple times a week would be ok but better left to when you are in the maintenance phase of your weight loss. 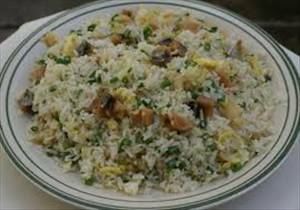 There are 323 calories in 1 serving of Chicken Fried Rice II. Calorie break-down: 21% fat, 32% carbs, 47% protein.